Fresh off his triumphant Elk (not moose) show, artist and weatherman Bruce Laidlaw is at it again. This time he asks, Do other people name their favorite rocks? Our name for the rock in front of our cottage is Tiger Rock. We learned that name from the granddaughter of the woman who sold us our place. The granddaughter visits Tiger Rock when she is in the area. She told us that the huge rock in front of the Good jetties is Big Bertha. With the water as low as it is, Tiger Rock can be quite a navigation hazard. When we bought our place, I could stand on Tiger Rock and the water would come up to my chin. When I stand on it now, the water is just half way up my calves. This is how we mark the rise and fall of the Great Lakes. We measure them against our own beloved places and our own selves. The Army Corps of Engineers can calculate all it wants, but when we stand on tiptoe atop Tiger Rock – or Turtle Rock or Gull Island or Big Bertha – day after day, all summer long, year after year, we know whether the lake level is rising or falling and by how much. Of course, the lake’s life is long and ours are short. It remembers the time before time, when it covered all the land Around Here to a great depth. It remembers rushing rivers of glacier melt. It remembers receding to a much smaller lake, the sand of its bottomlands blowing eastward to make the great dunes along the old shoreline. It remembers rising again, and falling, rising and falling. The lake, and the rocks under it, will be here a long time after we’re gone. Or perhaps not . . . but when they are gone, we will be gone too. Geologists have identified and named several important lake levels. The oldest and highest level is Lake Algonquin, whose beach is evident east of the Old Dixie Highway. During the Lake Algonquin period the entire Natural Area was submerged. 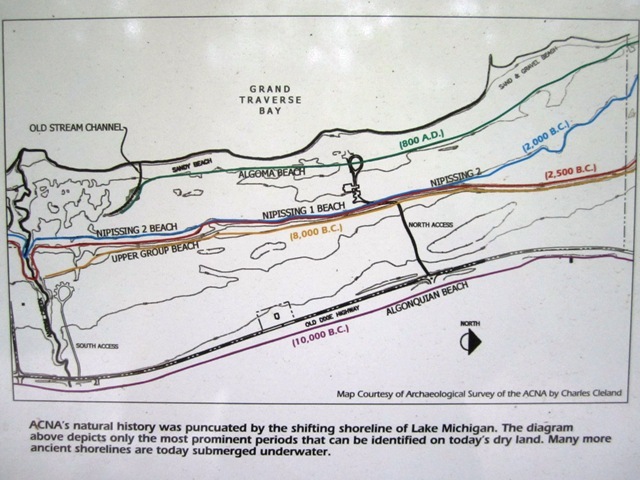 Later, a change in the drainage route of the Great Lakes caused a sudden drop (by geological standards) in the level of Lake Algonquin to well below the current level of Lake Michigan and exposed the lake’s bottom lands. During this period, known as the Lake Chippewa phase, many of the famous dunes along the eastern shore of Lake Michigan were formed by the prevailing westerly winds that carried the exposed sand and redeposited it along the hills of the old shoreline. The lake level rose and fell almost constantly in the subsequent centuries and some of the old shorelines are still visible where the level stabilized for a longer period of time. The map above shows the location of some ancient shorelines that appear in the natural area: Lake Algonquian Beach (10,000 B.C. ), Upper Group Beach (8,000 B.C. ), Lake Nipissing 1 Beach (2,500 B.C. 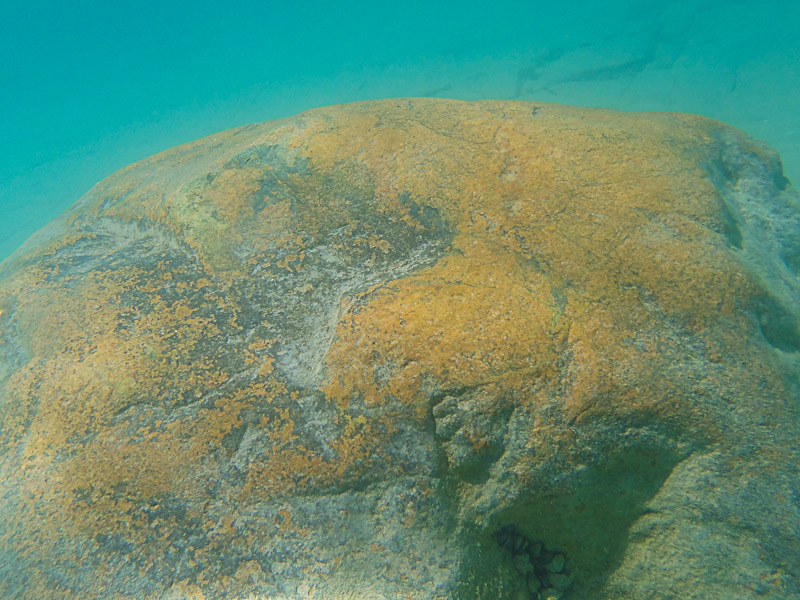 ), Lake Nipissing 2 Beach (2,000 B.C.) and Lake Algoma Beach (800 A.D.). I also found a dandy description with diagrams at the Geography Department at Michigan State University. If you’ve read this far, you’ll really like that. ← What are we bid? And a little update. I had lunch at Sonny’s today with Louan, and we ran into the Goods. I asked them about Big Bertha. They said that everyone always told them the big rock out in the Bay near their house was “as big as a Volkswagon Beetle.” They never dived down there to see for themselves, so it might be a folk tale. Oh, this rings so true. From what I’ve observed, people in other parts aren’t quite as emotionally tied to their rocks as people from Michigan are. I’ve moved my shoreline rock finds all over the country — they’re always unpacked second, right after my books. I’ll never forget the time my brothers and I played on and off a huge rock at a state park beach somewhere in northern Michigan (I was too small to remember where). When we went back the next year it was gone, and I was heartbroken. Thanks for the memories. Long live Tiger Rock. 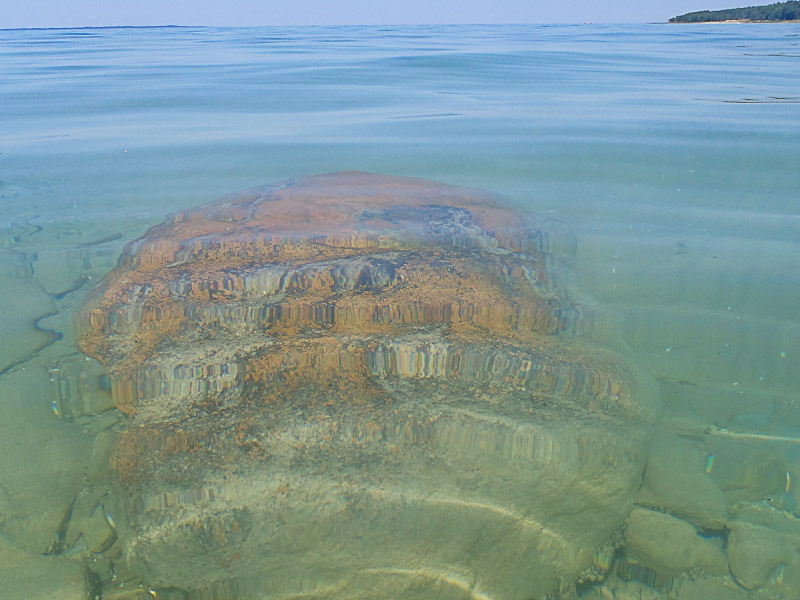 I’ve been giving a lot of thought to the rocks that emerge from Grand Traverse Bay and then submerge again. The shifting sands have managed to bury whole towns along the shore, so it’s no surprise that even a large rock might disappear. What I cannot figure out is where some of them come from. Last year I walked along here – and I have photos! Hundreds of photos! But that rock – that rock that is large enough for me to sit on with Miss Sadie and the Cowboy – that rock does not show up in any of the photos. Sand washed away from here and piled there? Probably. We are having a thorough drenching for Independence Day. Hope you are having whatever you need out there! Amazing how time flows like the water routes around us. Your last statement about what will happen to us when the water disappears was jarring. Let’s hope that never happens. Ah well. I can maintain my equanimity because I am pretty sure that we are talking about milennia passing before the water turns to clouds and the planet becomes Something Else. By then a new Noah will emerge to build a different sort of ark, and off the species will go to start all over again. I have come to the conclusion that we have less power – and more responsibility – than we think we have. Aye, that we do and I wish more people would take up more responsibility. I could use a wishing rock around here. Very interesting post, picture, diagrams. thank you Gerry. One life is such a short time in regard to all ages of our Earth. Yet, as Scott wrote, I also wish we would take up more responsibility for the time we are to live on this precious planet. Rocks bear names here too although I do not know of any in our lakes. In the mountains they would be landmarks for shepherds, hikers, welcomed and beautiful mossy rocks for a lost traveler through deep valleys or high mountain pastures. Loved your response to Scott too. Good morning, Isa. You make a good point. We always look for the markers that will help us find our way home – or to our destination. Rock formations, a crooked tree, a constellation of stars. We look for them and, having found them, give them a name. It makes me wonder how animals find their way through the world, and show each other the way. I’m catching up on your latest blog post after being up to the Cedars Resort for the 24th time, in Central Lake this past week. I took wondered about lake level, and here’s your newsy blog post to clarify thing a bit. I noticed slightly lower tide/water line at Barnes Park’s beach. I noticed a bit more stone exposed. With your photos, and your geography/lake line references, I think I’ll be passing this along to my Geography major husband for a look see. Hi Deb – I’m glad you enjoyed the post. Earlier today I was admiring the steep ravine beyond a garden. “We’re on an end moraine,” the homeowner told me. “They all look like that.” All the way home I wished I’d had more geography courses, and that I could have a guided tour of Antrim County landforms with someone who could explain it all to me. Like Chuck Cleland, for example. Nice to have a geographer in the family.